It is with deep sadness that I first read yesterday morning of the repose of His Eminence, Metropolitan Philip. Being very new to Orthodoxy in general, and to the Antiochian Archdiocese in particular, I did not get to meet Metropolitan Philip, and the little I know of him is through conversations with my bishop, and our priest and Khouria, and things written about him on the internet. The former were almost exclusively positive. 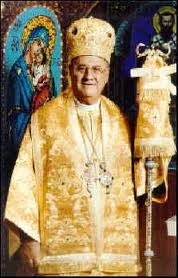 Bishop Antoun spoke positively of Metropolitan Philip, and of their relationship together. When he spoke of the Metropolitan, it was almost as if the two men were one. I believe this is because Bishop Antoun wanted to make clear that he and Metropolitan Philip spoke with one voice. In this country, such solidarity is sometimes seen as a sign of weakness on the part of the subordinate person, but in Orthodoxy, it is a sign of great strength. As the will of Christ and His Father are one, so should the voice of the shepherds Christ appointed be one. This is not to say that disputes between bishops will never arise. Only that our bishop was careful not to give any such disputes a public face (and I should be clear I am unaware of any between Bishop Antoun and Metropolitan Philip). Our priest informs us that at a time when the Evangelical Orthodox were having difficulty being accepted into an Orthodox jurisdiction, Metropolitan Philip was very accommodating. Not only did he work very hard to ensure their reception into the Church, he worked with them, setting a timetable to get liturgical issues in line. For example, early on, the EOC set Orthodox Troparia to familiar Western hymn settings such as "Amazing Grace" and the like. This is obviously improper, as the Troparia have a designated Tone, but rather than force the issue early and make the transition to Orthodoxy difficult, Metropolitan Philip gave EOC parishes several years to learn the proper settings and assimilate. Through all of the public controversies surrounding Metropolitan Philip, Father and Khouria never let us forget their great love and appreciation for him and all he did to bring our little parish into the Church. The news stories, particularly on the internet were unfortunately often negative. From financial scandals to demotion of bishops to actually deposing bishops from their dioceses, news about Metropolitan Philip on the internet was not often edifying to read. As a Lutheran convert, I also heard from Lutheran pastors who were quite unhappy that, from their perspective, Metropolitan Philip was picking off their pastors and convincing them to become Orthodox. The face such stories and accounts put on our archbishop was not a pretty one. And as a new convert, this was both disconcerting and helpful. Disconcerting because one never wishes to read about scandal in his Church. Helpful because it helped to quickly put to bed any thoughts that I had entered a perfect Church that was above criticism. It's hard to be triumphalistic toward other traditions when your own back door needs a healthy sweeping. This negative news humbled me and reminded me that joining the Church should be done in spite of her flaws, not because of the lack of flaws. I have no idea how to reconcile these two widely divergent views of the man. I expect, as with most things, the truth is somewhere in the middle. And I pass no judgment on the man, either for his accomplishments or his failings. I will say that he was our shepherd, and we commemorated him every Sunday in our ektenias. And we loved him, because he was our shepherd, not because he was perfect, for Christ loves us despite our flaws, and our Metropolitan loved us despite our flaws. As we prayed for him in his life, we now pray for him in repose. May his memory be eternal.